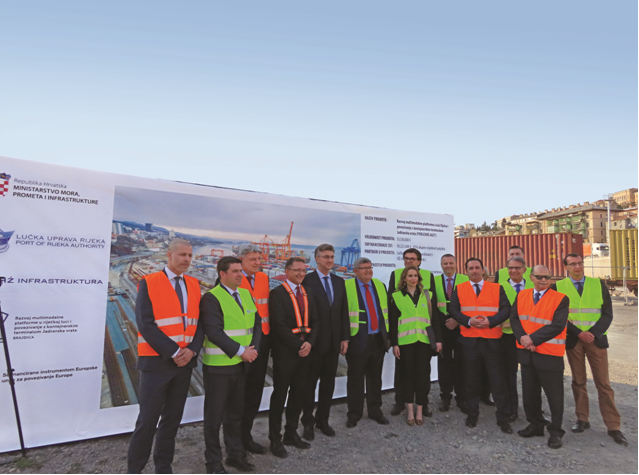 Prime Minister Andrej Plenković visited the construction works on the reconstruction Rijeka-Brajdica railway station and the construction of the intermodal terminal in the port of Rijeka and the Clinical Hospital Center during his stay in Rijeka. 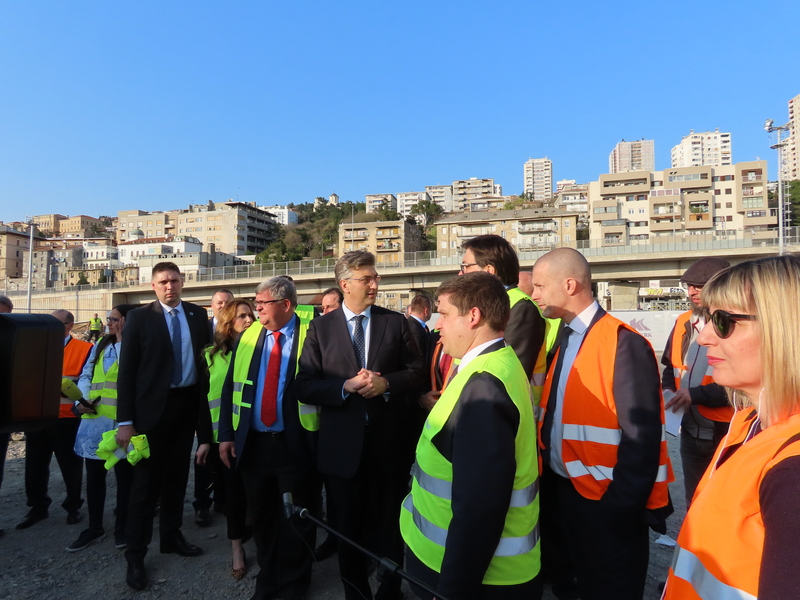 Prime Minister Plenković and senior officials of the Government of the Republic of Croatia first visited the works on the reconstruction of the Rijeka-Brajdica railway station and the construction of an intermodal terminal, a joint project of the Port of Rijeka Authority and HŽ Infrastructure. They were welcome by President of Governing Council of the Port of Rijeka Authority Bojan Hlača, Executive Director of the Port of Rijeka Authority, Denis Vukorepa, President of the HŽ Infrastructure lvan Kršić, and Wojciech Szymulewicz, Executive Director of Adriatic Gate Container Terminal, concessionaire at Brajdica Container Terminal. “The terminal at Brajdica, worth more than EUR 30 million, is part of the total investment of as much as EUR 200 million currently taking place in the port, railway and road infrastructure in Rijeka. In three years Rijeka will have new capacities, faster integrated connectivity and solve the road problem. It is one of the more expensive projects of the D-403, which will enable a faster and simpler exit from the Zagreb Deep Sea container terminal on the highway,” Prime Minister Plenkovic said. 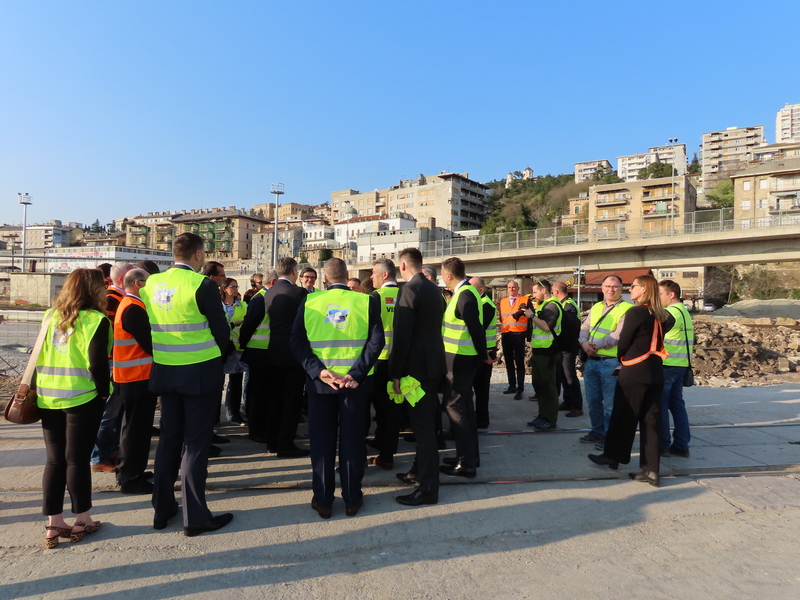 The project called “The multimodal platform development in Rijeka port and connection with the Adriatic Gate Gateway terminal (POR2CORE-AGCT)” is worth EUR 35.5 million and 85% co-financed by the Connecting Europe Facility (CEF). Extensive works will be constructed in three phases, a new intermodal terminal will be built for the purpose of transiting the trains at the Adriatic Gate (Brajdica) terminal, reconstructing the existing Rijeka-Brajdica railway station and extending the existing 400m long Sušak tunnel with the construction of the outbound track in the extended tunnel. By constructing this new intermodal solution for the container terminal of the Adriatic Gate, the share of rail transport in the transport of containers on the Rijeka traffic line will increase, thereby enhancing the multimodal platform in Rijeka. The works on the reconstruction of the Rijeka-Brajdica railway station and the construction of the intermodal terminal began in August 2018 and the project will end in December 2020 and will coincide with the completion of the other six infrastructure projects co-financed by the CEF program implemented by the Port Authority of Rijeka with its partners. The total value of all seven projects is EUR 132.8 million and their implementation is under way. The project will also be completed in parallel with the completion of the project on the construction of the multimodal platform at the Adriatic Gate (Brajdica) container terminal in parallel to the modernization of the railway infrastructure and the construction of new intermodal capacities on the new Zagreb Deep Sea container terminal, reconstruction of the General Cargo terminal in the Rasa basin, the Port Community System of the Port Community System, and dredging of the southern berth at the Adriatic Gate (Brajdica) container terminal. This complete improvement of infrastructure is a key prerequisite for the high competitiveness of port facilities in Rijeka and its better connection with the TEN-T EU corridors.